Nobody likes surprises, especially ones that cut into the bottom line of your business. Those surprises are often in the form of accessorial surcharges tacked on by parcel carriers. Accessorial surcharges are difficult to budget for because they’re usually assessed and applied after a shipment has been delivered. It can make them truly unpleasant surprises. If your business depends on product shipping, you already know you can count on annual general rate increases. It’s an amount you can calculate across the board and determine how you’ll compensate for it. Accessorial fees often change without warning and don’t follow any regular cycles. And because they usually are for specific aspects related to the shipping process, they don’t impact all businesses in the same way. As a business, you are at the mercy of parcel carriers. The predictability of their annual rates gets thrown out the window by sudden and unplanned for surcharge rate changes. The only way to compensate is to know your shipping data so you can quickly respond and protect your bottom line. For example, you may need to redesign your product packaging to comply with new dimension requirements to avoid a sudden surcharge. Carriers often increase surcharges by changing their definitions. For example, in addition to increasing general carrier rates in 2018, FedEx also changed the dimensions of packages that are charged additional handling surcharges. The dimension changed from 60 inches on the longest side to 48 inches on the longest side. 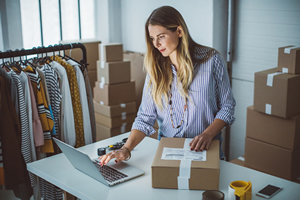 eCommerce platform BigCommerce observes that each carrier has a different set of surcharges, and if you’re unaware of what they are and how they differ between carriers, the costs can cut deeply into your overhead. In fact, surcharges can often be up to 40 percent of your total shipping costs. The company recently created a list of some of the most common surcharges. Residential surcharges: These are applied to deliveries that are made to a home address, and the reason it’s become a bigger cut into bottom lines is because there is a growing number of businesses that operate from home. Delivery area surcharges: These are applied to deliveries to addresses that are deemed as “rural,” or exceed a specific range from a carrier’s hub. Additional handling surcharges: A change in dimension or weight classifications like the FedEx example above exemplify this charge. Direct or indirect signature surcharges: These are assessed if a signature – or even a specific signature – is required for successful delivery. Declared value surcharges: As a business you appreciate the peace of mind provided by declaring a value on a package you send, but you’ll pay for the protection. Preparing for these surcharges is like preparing for a power outage. You know it’s going to happen sooner or later, but you can’t predict when. You can, however – and you must – anticipate that the carrier or carriers you contract with will make changes in their surcharges. A proactive and vigilant approach means that you can immediately respond to the surcharges. A quick modification may allow you to sidestep the surcharge increase. The only way you can successfully prepare yourself is to know and understand how your shipping profile interacts with the carrier or carriers you work with. The more data you have about your shipping, the easier it becomes to forecast the impact that an accessorial surcharge fee increase will have on your current shipping procedures. What is the best way to respond? Can the surcharge be avoided, or will it become necessary to adjust pricing? It may be difficult or impossible to reconcile these surcharge changes. In such cases, it may be time to renegotiate the contract with your carrier or carriers – or find a new one. All businesses have to make a profit, so it’s likely that the carrier has made the surcharge adjustments to remain competitive. They may be willing to negotiate to retain your business. It never hurts to ask if they will waive an increase to retain you as a client. But you’ll only have the upper hand in that negotiation if you’ve been tracking your shipping expenses so you can build the case. It’s also a wise business move to ensure that you are receiving all of the shipping refunds that are due to you in accordance with the performance guarantees you have from carriers. If you use overnight shipping by FedEx or UPS, you’re entitled to a complete refund even if the package is delivered one minute late. These refunds – if tracked and requested – could more than compensate for a change in surcharges. We can help you track and receive this refund revenue. Find out how.